How much has our sabbatical cost after 1 month in Indonesia? We have now been on sabbatical in Indonesia for 1 month. It’s been an incredible time so far and we’ve experienced so much already and we still have 2 months of our sabbatical remaining. One of the biggest obstacles to undertaking a sabbatical are finances so we wanted to check in and show what our sabbatical expenses have been for this first month. Keep in mind that these figures are based on our personal lifestyle and choices and may not be reflective of your own way of traveling or lifestyle. We have always been concerned about whether we had enough money to fund our travels. In fact finances derailed us the first time we attempted to take this sabbatical. Finally we just realized that we would never feel 100% comfortable financially and that we just needed to take the leap and do it anyway. We prepared and saved as best we could and finally we set the date, purchased the tickets and now here we are in Indonesia. So how much has this family of 4 spent during our first month in Indonesia? Here is the financial breakdown. 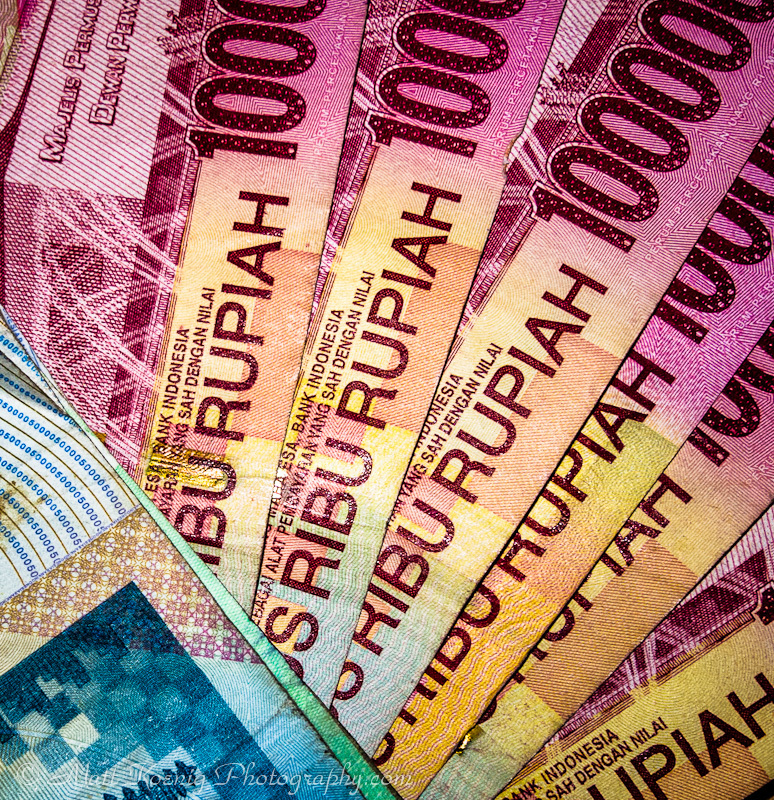 Note: We use RP9600 per Dollar as the exchange rate which has been the average rate during our month here. We have been fortunate in that for the first part of our sabbatical we are staying with family. That means that we don’t have any expenditure on hotels or rent. We are however, paying for Internet and the additional usage of electricity (it’s amazing how many electronic devices we have). We also help with miscellaneous household expenses such as hiring a maid to do laundry and purchasing a refrigerator. We broke our food category out between groceries (home cooking) and restaurant (eating out). Restaurant also includes to go orders that we eat at home. We also include water in this category as we purchase potable drinking water on a weekly basis as the water here at the house is not safe to drink. I’ve included the total we’ve spent on groceries as well as broken out a few key staple items and their cost. This category also includes shopping at large grocery stores and traditional markets including fruit/vegetables from street vendors. We have been eating out a lot, probably more than we should be but I have to admit, it’s easier, it’s generally tastier and it’s been a great experience trying new foods. It’s also more expensive. However, I think the experience of the various places we have eaten has been worth the expense. Food and restaurants here as compared with the US is generally much cheaper. As a family of 4 (six with the in-laws) we can eat at most restaurants for between $15 and $30. That’s for 6 people. We’ve eaten at fast food places to Sundanese (banana leaf plates and eating with your hands) to traditional restaurants where we ate in huts along beautiful bubbling streams. I have to say that after we added up the total for eating out I was a bit shocked. But thinking about the cool places we’ve seen and the excellent food we’ve eaten it was worth it. We don’t drive here and rely on my wife’s father to drive us everywhere. This guy has the patience of a Saint as he waits for us sometimes for hours. We pay for fuel (bensin), toll roads and other miscellaneous vehicle expenses such as air in the tires. Currently we just have vehicle expenses but when we go to Bali or Karimunjawa we will have airfare and train/bus expenses. We brought quite a few articles of clothing for our 3 month stay here in Indonesia but of course there are always those items that get left behind. I forgot my sunglasses and we were in need of some new clothes like jeans and shorts. And of course the kids wanted Angry Bird shirts that are seen just about everywhere here. Clothing is typically cheaper here than in the US for most things and I have to say the quality seems better. This sabbatical is all about having fun and enjoying our time here in Indonesia. While we have been sticking very close to “home” this first month we’ve still enjoyed lots of fun activities from Taman Safari, Trans Studio and Kampung Gajah not to mention all the smaller local sights. This will definitely increase as we travel further to places like Bromo, Bali and Karimunjawa. Items in this category include only the entry fees and do not include any food expenses or fuel/transport expenses. These are expenses that didn’t seem to fit into any of the categories above so I just threw them into this category. It includes expenses such as donations, cell phone service (unlocked iPhone), stuffed bear and haircuts for the boys. Many times using your ATM or credit card will incur fees from your bank. We didn’t have any bank fees and we won’t. This is because we use the Chase Sapphire Preferred credit card which does not have any foreign transaction fees. We also use the Charles Schwab Investors Checking Account which offers free ATM withdrawals and no foreign transaction fees. What this means is that we have access to our money without any additional fees. I’ve heard stories of travelers racking up huge fees due to charges of $5 or more per transaction. So far the only issue I have had was having my Chase card number stolen and used in Canada. Chase customer service was awesome and dealt with it quickly and sent me a new card to Indonesia within 5 days. That is service that keeps me as a loyal customer. I’ve had a few ATM machines that have not accepted my Schwab ATM card but for the most part I have not had any issues withdrawing money from my account. Most ATM machines even offer English instructions. I highly recommend both the Chase Sapphire Preferred and the Charles Schwab checking account if you plan to do any long term travel. I may have missed an expense or two here or there but the bulk is listed above. Right now we are sitting at $1,612 (RP15.513.682) expended for the month. That’s about $13/person per day. It’s a little above the $1200 we initially anticipated for this first month but well within our total sabbatical budget. We will have to watch the restaurant expenditures more closely as I am a bit surprised we spent so much eating out but I also don’t want to limit our experience here either. This next month we have plans to travel quite a bit more so our transport costs will increase as will our eating out costs. Still I am quite happy with our expenditures to date and the experiences they have provided us. We will provide further financial updates after the second month of our sabbatical as well. If you have specific questions about our expenditures or budget feel free to contact me. I know for us when we were planning our sabbatical finances were a major part of the equation so it’s good to work those questions out early so they don’t trip you up later.